Today, you’re going to see the most popular ideas for medium hairstyles for round faces. When picking out a style for a round face, you want one that thins out the roundness of the face while accentuating the eyes, lips and cheekbones. Facial framing can be achieved with bangs and layered tresses. These medium length haircuts are versatile and fun and can be worn with almost any hair texture when styled properly. These hairstyles are designed to be more flattering to a round face by making it appear longer in length and framing key areas. 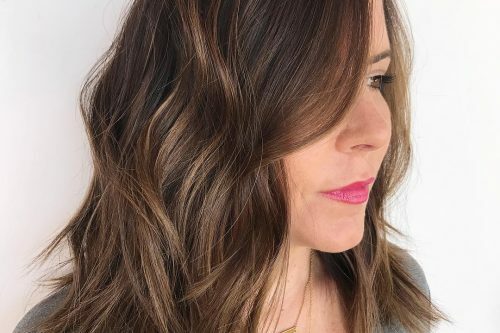 This look is more of a lob than an a-line bob. I put more texturizing and layers to give the cut added body and movement by using the feather razor. To give the bob a softer look, I decided to use the feather razor. This means that when I cut the sections, it wouldn’t be a clean blunt cut, but more textured. In a way, you could compare it to point cutting, however, the razor already does the job and takes some weight off the ends. Leaving the angle slightly longer and a bit more extreme gives it a softer touch around the face. 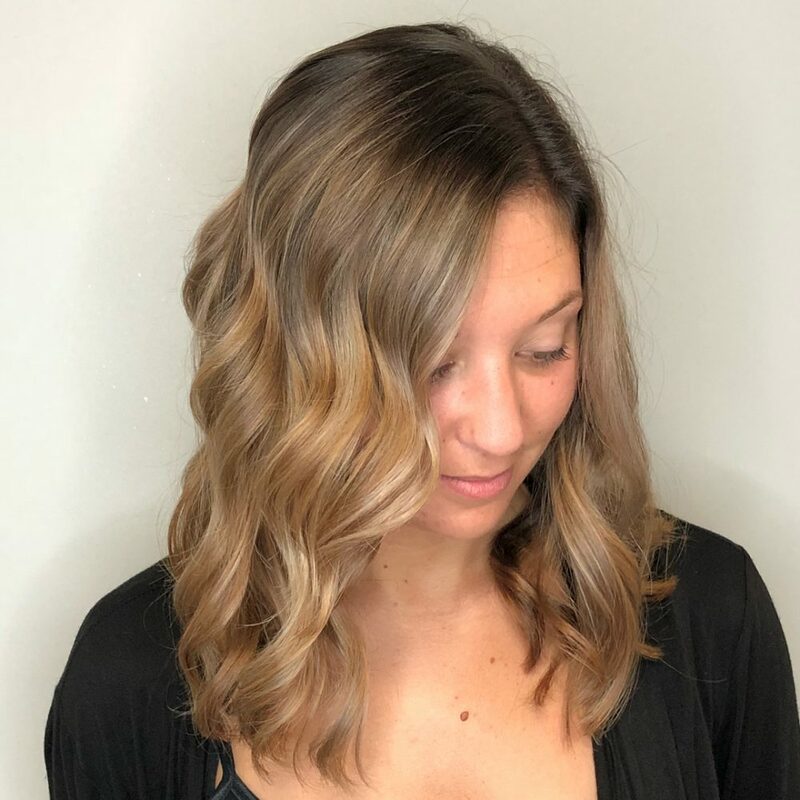 What I love about a long bob is that the cut is versatile enough that you can style it either straight or put in some loose waves. Using a feather razor for fine/normal straight hair won’t leave demarcations like shears would. You can do a lot with a razor, and utilizing a texturing technique gives it an edgier look. I also love the subtle face-framing because it really complements the round face shape. You have to be sure not to go too extreme with the framing around the face. Overall, depending on how you style and what products you use, you can have either a chic or edgy look. You definitely need to put some effort into styling this look. Like I tell all my clients, you can’t be lazy to have your hair look awesome. You will definitely need to blow dry with a round brush at least, depending on your hair texture. All I used was a blow dry protectant since we did color her hair as well and needed to wait 48 hours before washing. I never overload the hair with too much product. You can refine some parts with the flat iron. You can prep your hair with sea salt spray, use a styling wand to give some body, and finish off with a dry texture spray. This bob is more for ladies who have a round face shape or with a square jawline. Retaining the length around the face past the chin softens the face by giving it a more of an oval shape. I would not recommend going above the chin, otherwise, it will empathize the round face shape or square jawline. Depending on the hair texture, it may take a little longer to style. This is not a wash and go type of hairstyle, so I wouldn’t recommend someone who doesn’t like to style or who doesn’t want to wake up early enough to take the time to style. This is a popular look right now because it is not too conservative or too extreme. I would describe this look as organic and easy. My favorite thing about it has to be how the modern, lived-in color and textured cut complement one another. My advice to any woman potentially considering a look like this is to definitely just have fun with it! Straight or curled, it’s a chic and playful length. Product-wise, a bomb texture cream/spray like Redken Spray Wax is a must have in your arsenal. I used a 1 1/4-inch Marcel iron to achieve these waves. This cut would flatter just about every face shape. 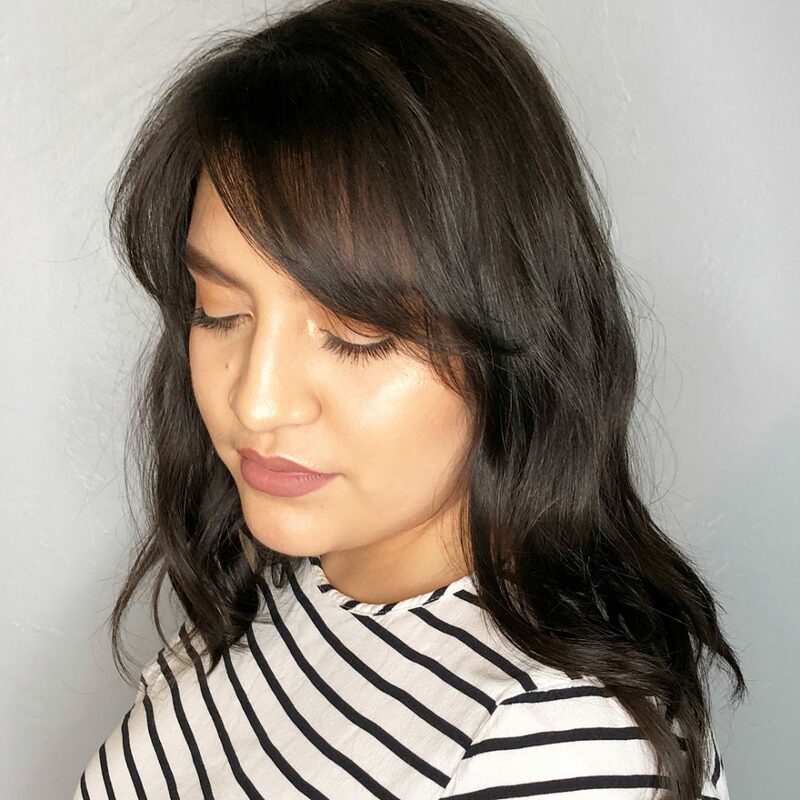 For the clients that are worried about their face being too exposed, you can totally just add some texture fringe bangs and have a whole new variation of the cut! This haircut is a lob with no layers. Her straight haircut falls just under her shoulders to hit her collarbone area. Avoiding layers with this look is always better so you don’t get that flipped out effect. My favorite thing about this look is how trendy it is. This is the most asked for haircut in the salon right now! If you are considering this look, I recommend Bumble and bumble’s Hairdresser’s Invisible Oil Primer. This pre-styler will protect your hair from heat and UV rays. Styling with this product makes it really easy to achieve that perfectly straightened look. You can also easily use a 1-inch wand to create gorgeous, tousled beach waves. The amazing thing about this haircut is that you can rock it with any hair type or face shape. It’s truly flattering on everyone! So if you aren’t into styling or want to just change things up, this haircut is definitely for you. 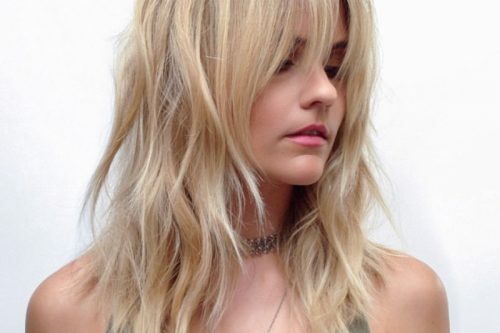 This cut is the hot length right now and everyone calls it the lob! There is a lot that I love about this bob. It works on many hair types and it is so customizable. The look is chic and trendy, yet age appropriate for everyone. It looks adorable straight or with a curl and is truly universal which is why I don’t see it going any anywhere anytime soon. Another huge bonus is that it grows out nicely! The look is such a modern update to a woman’s everyday style. 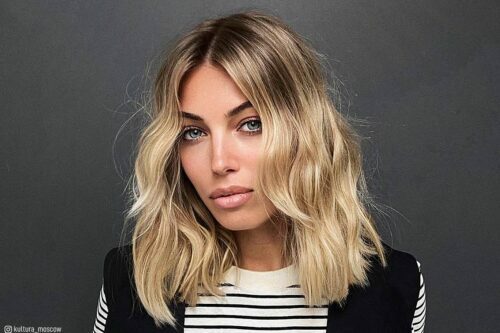 Since the bob has a slightly longer around the front, it is great for creating a slimmer face and softening the angles of heart or square shaped faces. I spritz Unite Boosta volumizer on the hair to get a nice lift at the root and some body. You can either tap the ends with the flat iron for a sleek look, or I like to use a 1 1/4-inch curling iron to create tousled waves. A great tip is to leave the ends out for a more effortless beach wave. Finally, I spray R+Co Trophy shine and texture spray to finish the look. My best advice I would give someone considering this bob cut is that you need to style it. It’s not a ton of work, but so many guests bring me pictures and the top thing they point out is how it’s finished. I can give you the cut and the tools, but you have to finish it at home and you truly can do it. The good news is that it still fits in a cute little pony because let’s be honest, we all have those days! This look gives all the carefree and easygoing vibes. I love this look because whether you wear it smooth, wavy, tousled or glam, it’s easy to style and always looks great. The shape of cut has a slight angle which always gives the hair a style, no matter how it is worn. Anyone can rock this style if they are wanting a low maintenance look. I created soft, textured layered hair around the face to accentuate my guest’s cheekbones and frame around her jaw. 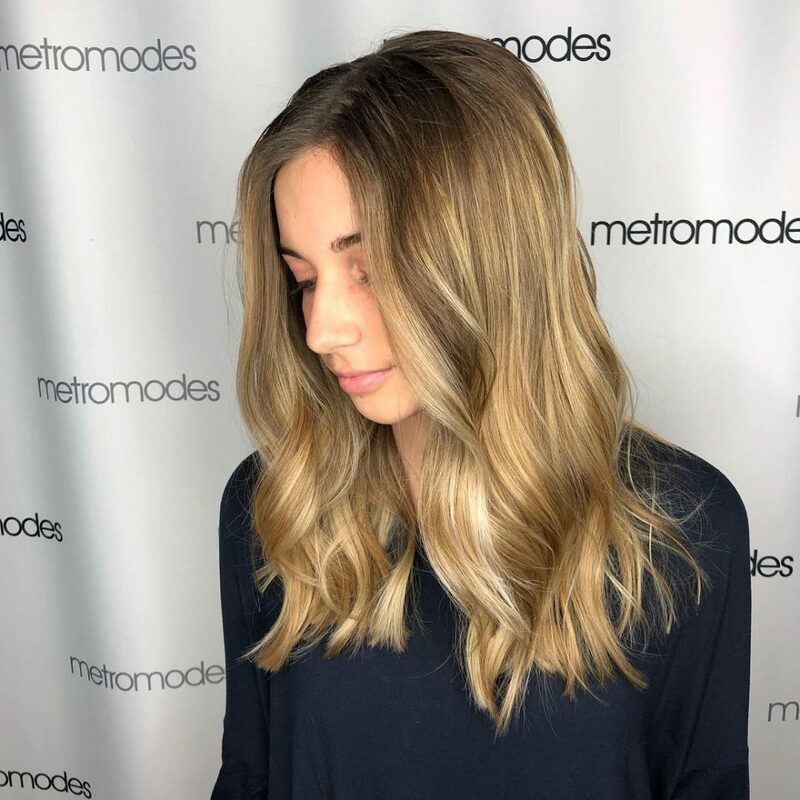 The color is low maintenance with just a pop of highlights around the face. This look is absolutely timeless. The haircut is adjustable and works with most face shapes, and can also range from edgy to conservative. It is easy to change from day to date night by adding tousled waves. 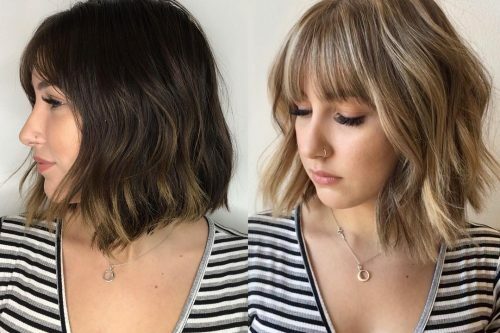 The long bob is versatile and a never-ending trendy look! Consultation is key. Determining the perfect length for this look is important. Here, we wanted to conceal unwanted features, so we discussed length and movement, which are key for round face shapes. Her hair is fine, dense and straight. After we determined her desired length, we talked about adding layers to create variations of length. Slight layers help with creating lift, and when curled they bring out hair color and add texture. My favorite thing about this haircut is her length. She has a gorgeous neckline. The just below collarbone sits perfectly while playing up her features and framing her beautiful smile. This look is casual but refined and is easy to maintain when using the right products. We began with Smooth Infusion Style Prep Smoother for protection against heat styling and to defend against humidity. We added a dab of Weightless Light Elements Lotion to tame frizz and control flyaways. After curling, we used Air Control for a lightweight hold. I recommend this look for those who are daring to go shorter or in transition from short back to long. 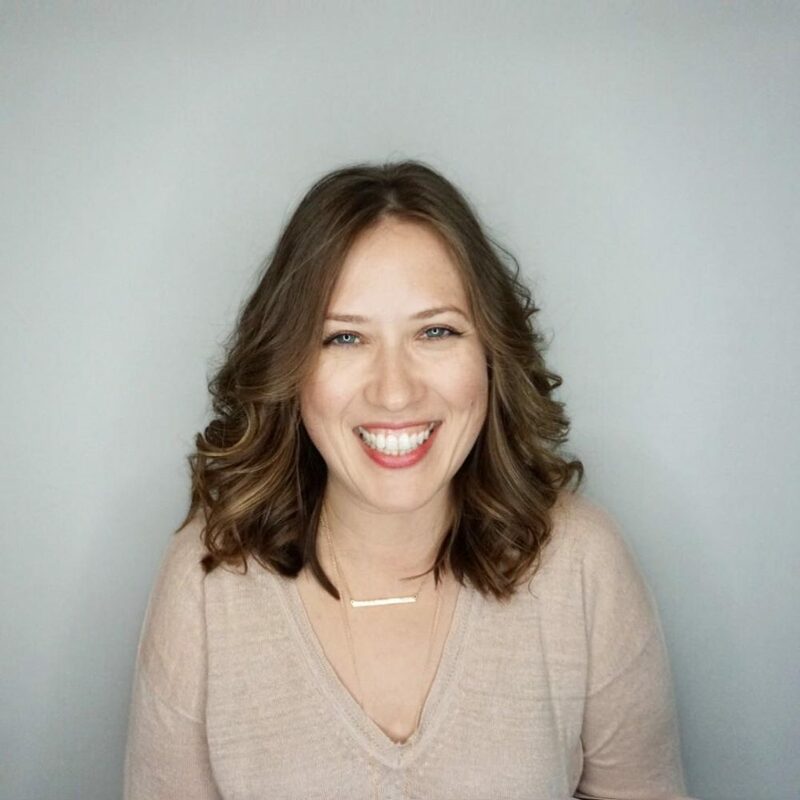 This look is also perfect for the busy mom like my lovely client here. No matter the hair type, texture or face shape, this look simply fits. By considering the length, movement, and products used, you’ll have an effortless look that’s easy to maintain at home. I would describe this haircut as an extra-long long bob with a side-swept fringe. Square layers are kept mostly in the back. We kept length on the sides with a blunt perimeter for a modern edge. 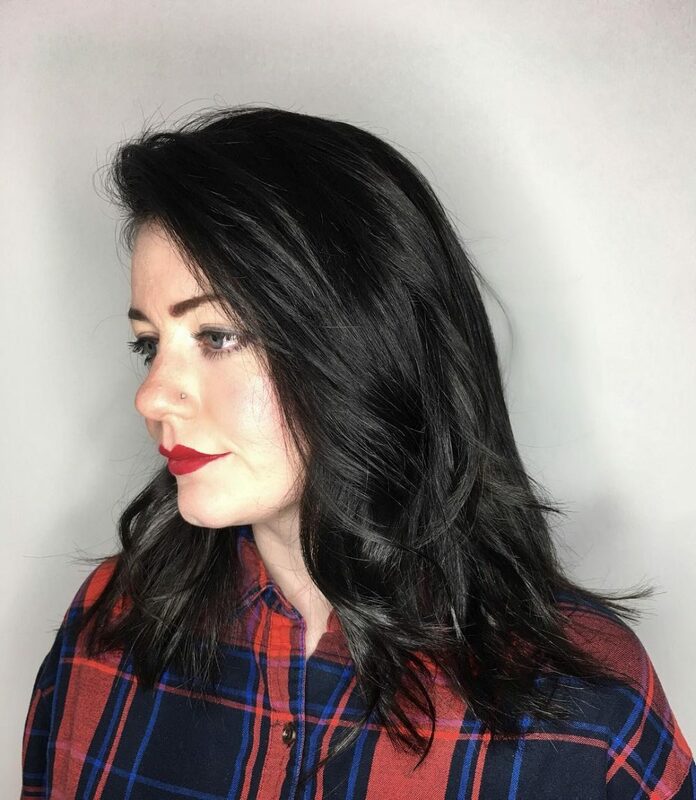 This side parting haircut is a great introduction for clients looking for a change from their regular long layered haircut. That is my favorite aspect of this style. Long bobs can be as short as above the shoulders, collarbone length, or somewhere in between the collarbone and chest. The longer length extends the face vertically, helping to balance the face. Side-swept bangs continue the elongating effect as opposed to straight across bangs. 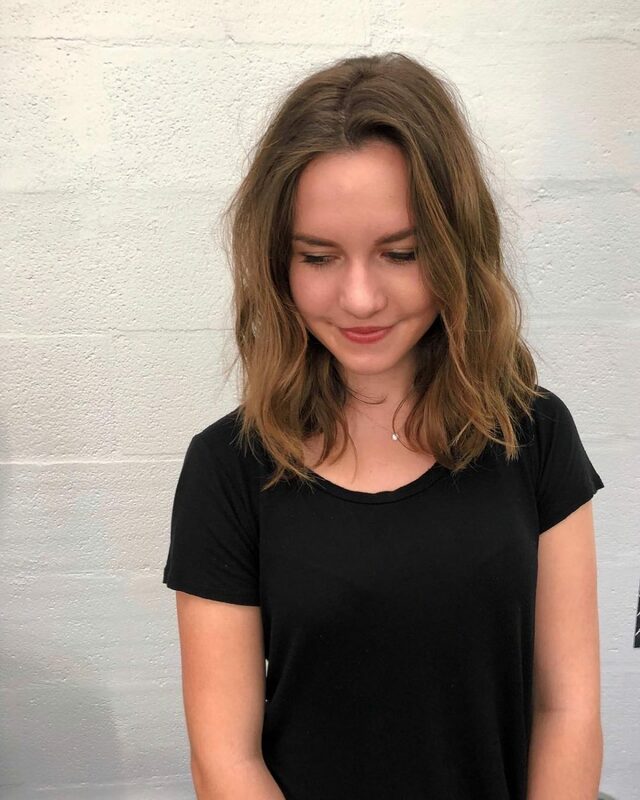 This length is still great for the active gal who likes to tie her hair back, as well as for the gal who likes to play with her natural wavy texture or wear it sleek and straight. Kevin Murphy’s Smooth.Again is perfect for taming frizz, and the dry texture spray by Davines is a great finisher for a tousled look. The look is called modern simplicity and this hair is very versatile to wear. It can be worn wavy, straight or air dried for a natural, diffused look. The coloring here with highlights is superbly done. 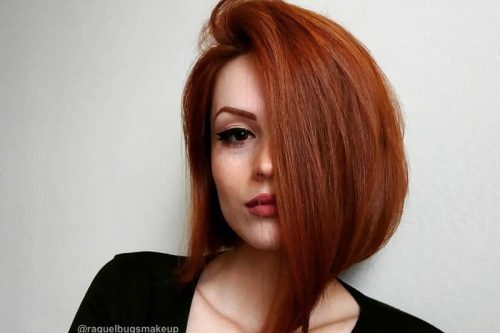 Hair coloring is another awesome technique for complimenting round face shapes. 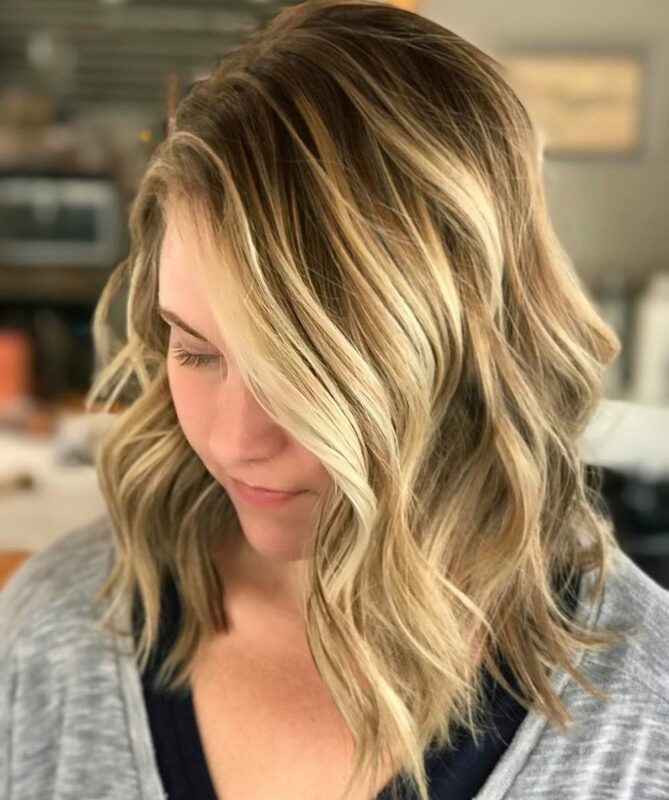 For this look, I used Milbon’s Luminous Softening Oil from mid-lengths to ends, blew it dry, then used a 1 1/2-inch curling iron to create soft waves. The styling possibilities are endless with this look! This haircut also works well with her face shape to accentuate her beautiful soft features. I would describe this as a textured lob haircut. My favorite thing about it is that so many people can wear this look. It can be sleek and classy or edgy and full of texture! I have given this bob haircut to many different types of clients. It’s super easy to style and works well with most face shapes, especially rounder faces. It can also easily go from casual to professional. To style, simply add little light mousse to damp hair, rough dry it, then enhance the waves with a big barrel curling iron. Now add some texture spray and run your fingers through to finish the look! 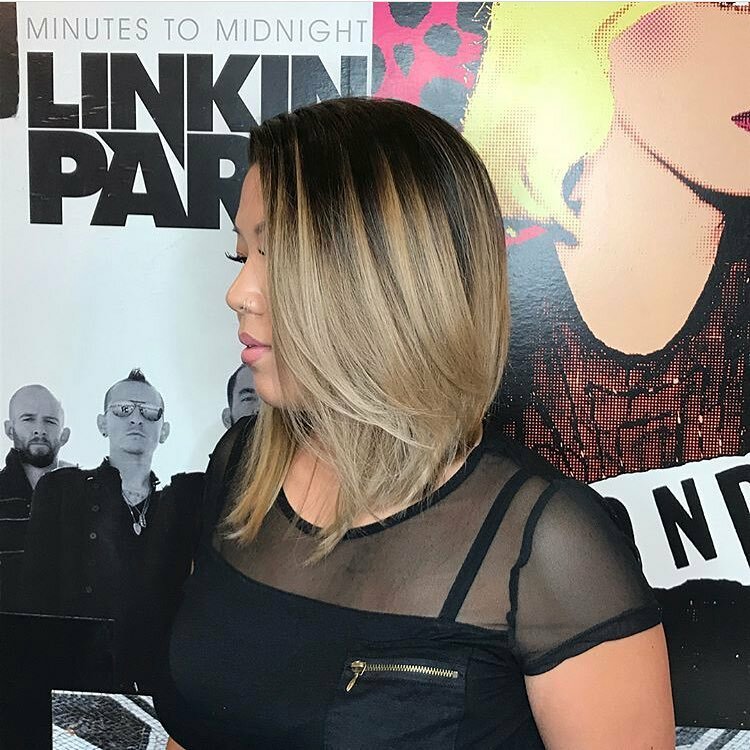 This client wearing a dimensional bronde, root-stretched hair color with a long, texturized lob haircut. I love the blend of the coolness in her root stretch that fades into the soft, lighter ends. They carry just enough warm tones to balance out the look. 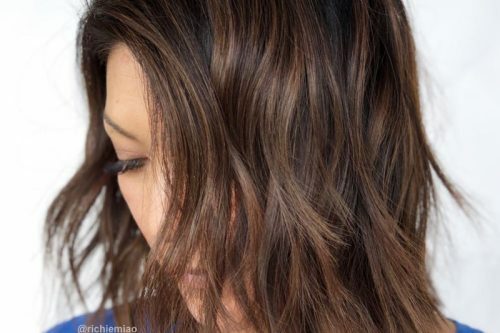 To recreate this look, simply start with a full head of highlights. I prefer Kenra’s Simply Blonde blue-based lightener with 20 volume. Lift most of the warmth out of the hair. 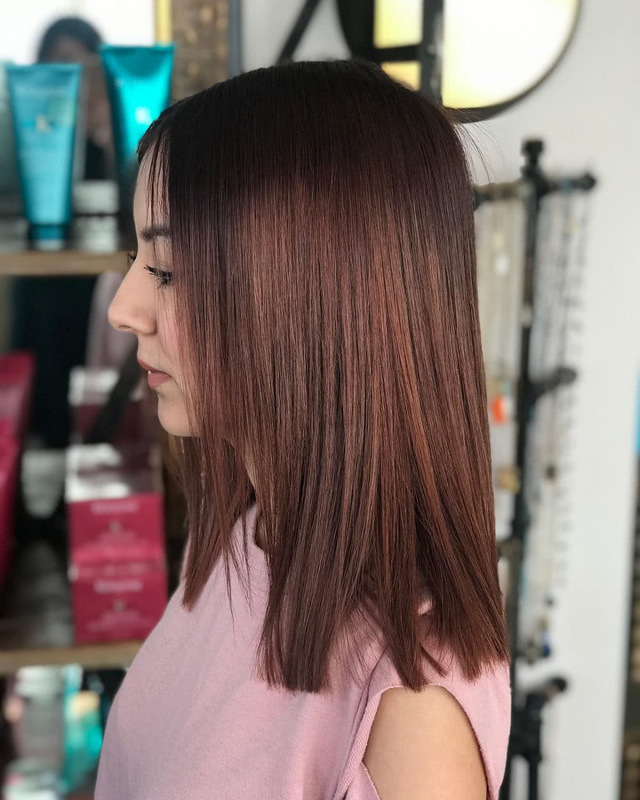 Once pre-lightened, root stretch down the hair shaft 1 1/2 to 2 inches with Redken Shades EQ 6T and process for 25 minutes. While processing, glaze the ends with Redken Shades EQ 9GI to add a beautiful tone to the pre-lightened ends. The haircut was done with a slightly blunt inversion toward her face. I texturized through the last three inches of the hair with a razor. To style this look, I used a 1 1/4-inch barrel curling iron to create the “twist out” beach waves. This style can be worn with a variety of face shapes. For a woman with a round face, I would recommend adding a fringe around the brow. For a more oblong face shape, I would take away the inversion toward the face. The color is complementary for a neutral to olive complexion. 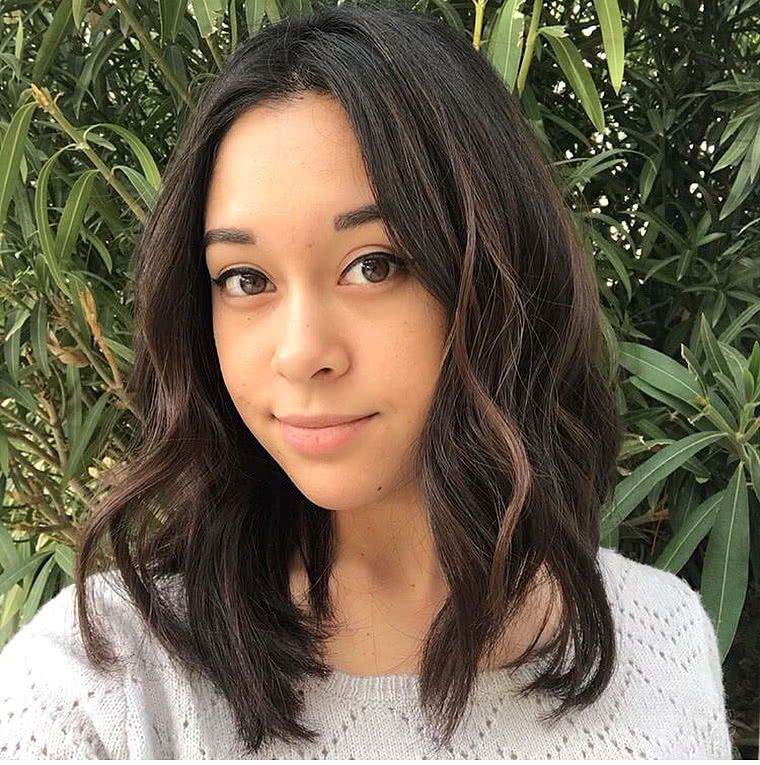 Leaving a little bit of length to the haircut makes it perfect for someone with a more active lifestyle that needs to have the option to get their hair out of their face. I think it looks best with a little texture added to it. Whether you use an iron to add a beach wave or if you are lucky enough to have natural texture, show it off! This look is simply a melted, perfectly undone “lob” or mid-length cut. 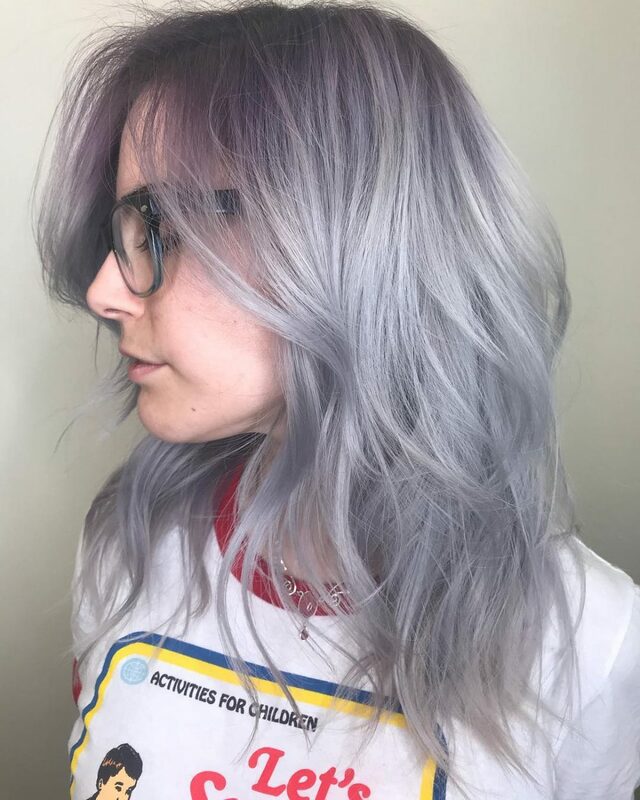 The color is a berry/violet rooted silver melt. This client showed me inspiration photos and I went with the flow! 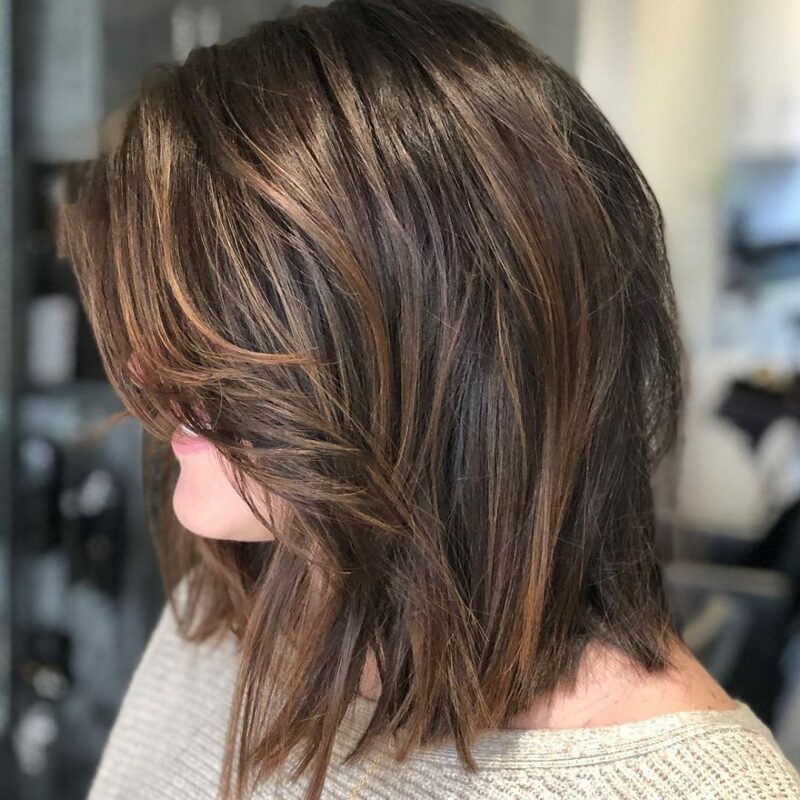 My favorite thing about the bob is the melt and waves. I look for anything with texture. I love silky smooth blowouts, but I really love this textured and undone look. I recommend the Oligo Blacklight shampoo and conditioner for color upkeep, as well as any deep conditioning masques or treatments. This client took home a LOreal Masque. 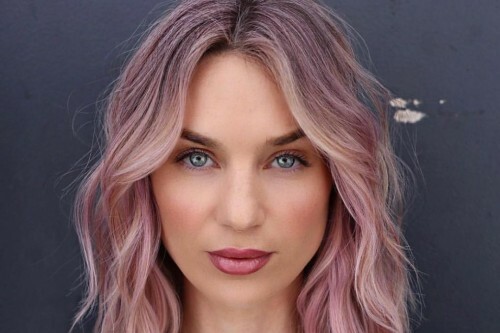 Recreating this look would require the amazing color line provided by Guy Tang and the amazing Babyliss Pro 1 1/4-inch curling iron. I recommend this bob for any fashion forward and artsy kind of person. My client dresses up a lot in character and doesn’t care about coming in often for touch ups. It is ideal for anyone who likes maintenance. I personally don’t think about face shapes or density, but this client had medium textured hair and a lot of it. It was texturized for days to keep that whispy look. This look is perfect for anyone who likes a little upkeep, is fashion forward, and loves loud, funky hair. I would describe this look as a long textured bob with a deep side part. My favorite thing about it is the styling versatility and the ease of creating a chic, undone look at home. I recommend products for texture. Depending on the hair type, I recommend a beach texturizer (I used Kevin Murphy Beach.Resort spray) on wet hair, then something to piece out the layers once dry like Kevin Murphy Bedroom.Hair. 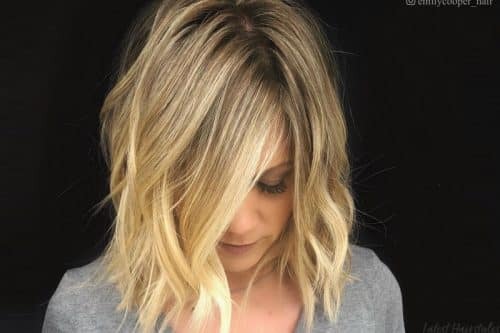 I recommend this long bob for someone with medium to thick hair and enough hair to have lots of layers. The cut can work on a variety of face shapes depending on where the layers and the part sits. For a woman with a round face, the styling can be really important in creating a flattering style. The layers really give you the ability to tailor the cut to suit the face and desired style. 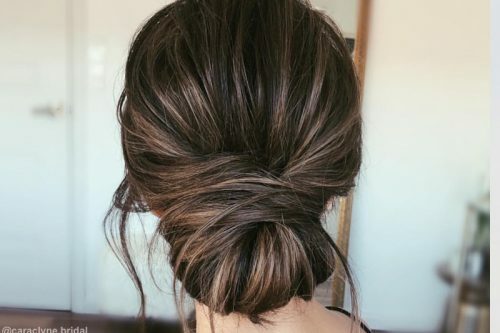 I wouldn’t recommend this cut for someone who wants to be able to pull all of the hair back into a ponytail, but it’s perfect for someone wanting to change up their look without doing anything too drastic. I would describe this look as modern and effortless. It’s a very chic look that flatters pretty much every face shape. My favorite part of the look is the waves. Bedhead and messy waves are very in right now, and this type of haircut shows them off perfectly. 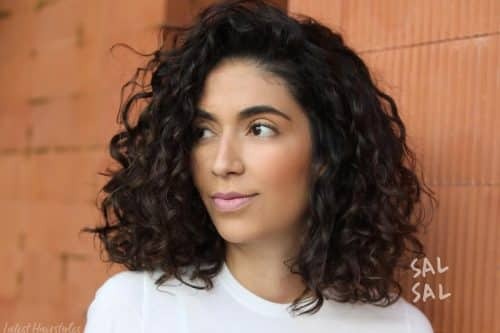 To recreate this look, simply wave your hair with either a flat iron or larger barrel curling iron, break up the curls with your fingers, and then spray a texture spray all over for added grit and volume. To preserve the look, spray dry shampoo at the roots on second and third-day hair. It is a very easy look to create and maintain. I recommend this to all types of clients, and it really isn’t exclusive to one hair type or texture. I think it is a great look for pretty much anyone and is perfect for those who are low maintenance. 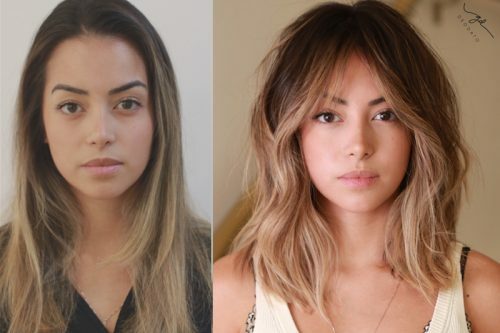 It isn’t too long or too short, and the layers give it a sexier look for anyone feeling bored with their hair. I would describe this style as a mid-length haircut with long layers and textured fringe. My favorite thing would have to be the fringe (bangs). Not everyone can wear bangs well, so when someone can pull them off and loves them, it makes it worth it for me. It depends on your hair texture! I think overall, I recommend a good 5-in-1 blow dry cream. Living Proof PHD cream and Virtue 6-in1 are my favorites. For finer hair, use something for volume like a mouse or texture spray like Shu Uemura Texture Wave. For coarser hair, use something for smoothing like Virtue Smoothing Cream. I recommend this look for someone who is willing to style their bangs every morning. Bangs are a commitment, so if you are up to styling them every day, this look is for you! This look also works well if you put your hair up a lot. The bangs help you feel like you still have a style if the rest of the hair is in a bun or a ponytail! Blunt bangs cut right over the eyebrows helps facial framing for round face shapes. 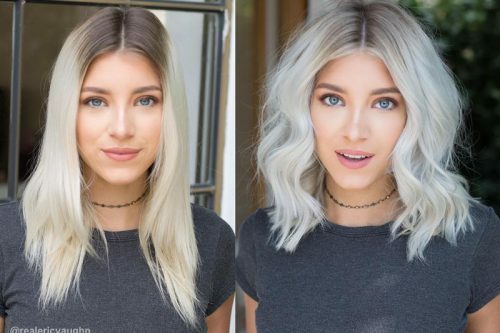 This look works best for hair types that are on the fine to medium side. This is a medium length layered style cut with a soft side fringe. Towel dry hair, apply Moroccan Oil’s Hydrating Styling Creme and blow dry with your fingers. After most of the moisture is out, smooth with the blow dryer and a large round or paddle brush to give a bend to the ends. Apply Moroccan Oil’s Luminous Hairspray for texture and hold to finish. Moroccan Oil’s Styling Cream, Glimmer Spray and Luminous Hairspray. It’s a great cut for those with thick, medium to fine hair that is straight. Tip: Always apply products with your hands to avoid using too much or getting too much in one area. Blow dry in the direction you want your hair to fall and smooth with a large round brush and dryer. Setting the ends with a curling iron will ensure the hold of the style. Towel dry your hair as much as possible and comb the hair out straight. Apply Bumble’s Thickening Spray and blow dry with your fingers and a paddle brush to keep the hair very straight. Flat iron if necessary, using Bumble’s Gloss Spray for protection then finish with your choice of hairspray. Bumble and Bumble’s Styling Creme, Spray Shine and Classic hairspray for flexible hold. This is a perfect style for women with a round face and medium to fine hair. This style would also work with almost any face shape and various hair textures. Tip: Flat iron to maintain the sleekness of this style. Add hairspray and a bit of glimmer spray for hold and shine. This shag with bangs has been heavily texturized to remove all weight, so it’s light and feathery. Towel dry your hair and apply Bumble and Bumble’s Styling Thickening Spray and blow dry with a paddle brush. Flat iron using Bumble’s Shine Spray and apply Bumble’s Spray de Mode Hairspray for texture and hold. Bumble and Bumble’s Styling Lotion, Thickening Spray, Spray Shine and Spray de Mode hairspray. This is a perfect style for women with round faces and medium to fine hair. This style would also work with almost any face shape and various hair textures. Tip: Apply a light amount of product and blow dry with your hands to get most of the moisture out. Smooth with a large round brush and dryer and flat iron if needed.